Locked articles on the Wall Street Journal can be accessed if you google the title of the article and click on the top search result. However, repeatedly doing this for all the locked WSJ articles can be cumbersome. We've automated this process - we've written a script that scrapes the headline of each WSJ article and appends the URL to make it appear as though Google is the referring website. We trick the WSJ into thinking the traffic is coming through Google - in doing so, we unlock each news article for free. 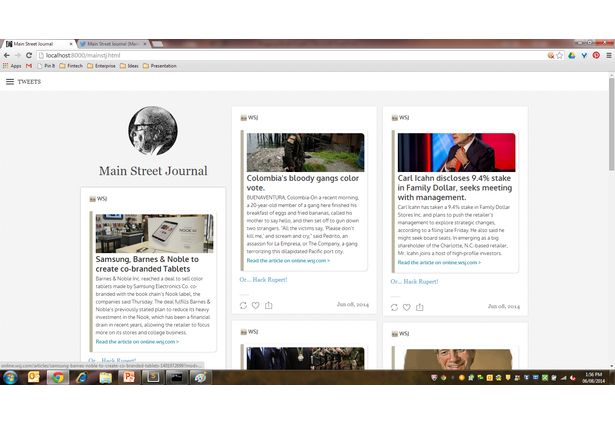 We present each link on our own website that we call "The Main Street Journal". We use Embedly to provide a short snippet and image for each news article. We've built the site in HTML5/CSS3 so that it's responsive and mobile compatible. All unlocked news articles are auto-Tweeted for users that don't want to visit our site. Comments for this submission are closed. View the software in kyu_seob_kim's portfolio to continue the conversation.